Which wide receivers, tight ends and running backs have the best receiving match-up in week 9? The goal of this article is to highlight where an offensive may choose to attack a defense based on the past results of their opponents defense. In this copy cat league, once a team exploits a certain area of your defense other teams will follow suit. 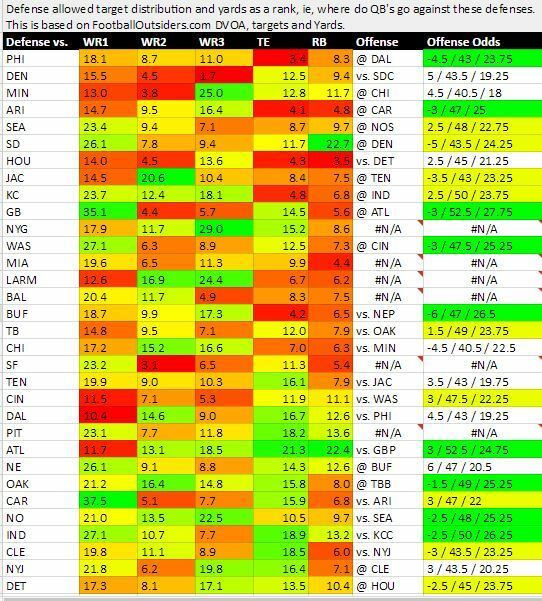 Using this heat map we can pin point the most favorable areas to target in in week 9. We look at the pass targets and yardage for RB, WR1, WR2, WR3 and TE. We then creating heat maps to showcase where each team has been getting exposed via the pass. You'll also see I've added the team defense fantasy points allowed by position to help you figure out the favorable matchups. Here's the week 8 heat map. Missed the mark on a couple and hit on most others. For example: Julio Jones didn't go off, but he got hurt (knee bruise) so Sanu when off instead. That's the volatility we're all too aware of in fantasy football. I had to add DvP (fantasy points allowed per position) to the heat map. 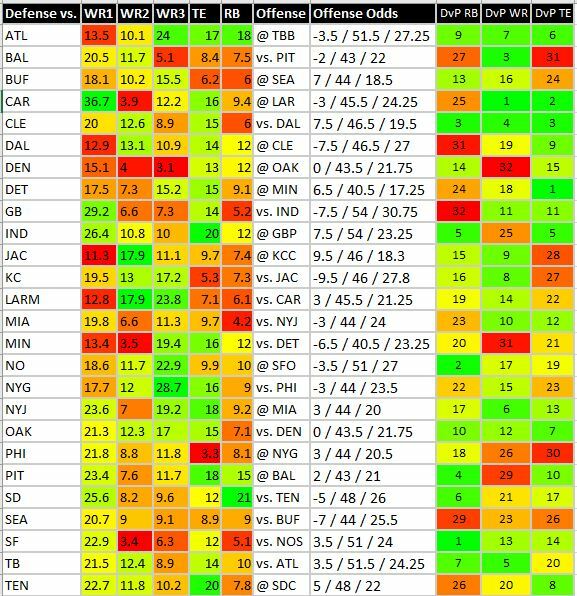 This is because the heat map looks at production on the field more so than fantasy points. Fantasy points is what we're after and combining the visual heat map with DvP and the Vegas odds we can get pretty close to figuring out where the best opportunities exist. So here's who I like this week per the heat map. Jordy Nelson hasn't gone off in awhile now so he's due for a big one. Based on our DL vs OL chart, Rodgers should have that extra second needed for Jordy to get deep. If Vontae Davis is out for the Colts, their top DB, I'm playing Jordy for darn sure. Otherwise I may pivot to Adams. Carolina showed up last week but JJ Nelson still found his way into the FanDuel perfect lineup. Britt or Tavon Austin has a serious chance to feast on a burnable Carolina defense. My bet is Britt if he's healthy. Corey Coleman or Terrelle Pryor is primed to have a huge day as the Cowboys just lost top CB Morris Claiborne to a multi-week groin injury. This makes the Browns an interesting plays in DFS. Both Coleman and Pryor have tags though so watch their injury report updates with our player tracker. TY Hilton isn't a player you needed me to highlight. Brandon Cooks is the WR to own in New Orleans vs SF. ATL and TEN running backs represent the best PPR matchups. Pitta, Ebron and Brate all have solid matchups at tight end.